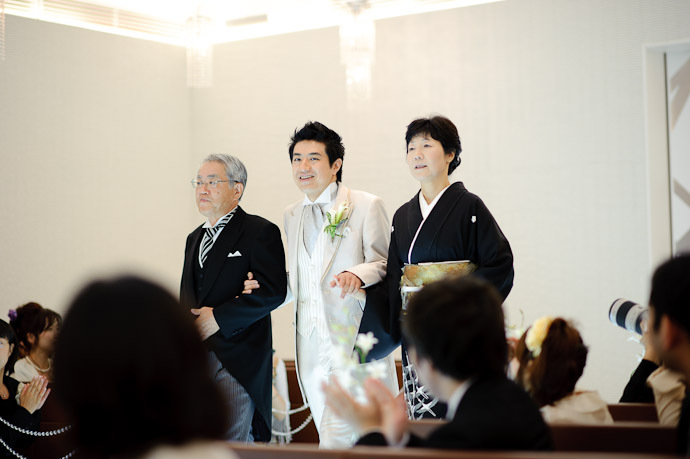 Fumie's brother (my brother-in-law), Shogo, got married yesterday, to Namiko Shimoya, in Nagoya Japan. I was there as a guest, but of course I had my camera, so took a few snapshots (about 1,200). I hold out hope that at least a few came out. The day's events started with a short ceremony in a Western-esque chapel, then a short hors d'oeuvre reception, then the full-on wedding reception party. I've only glanced at the photos from the first part so far, so that's what I'll present in today's post. 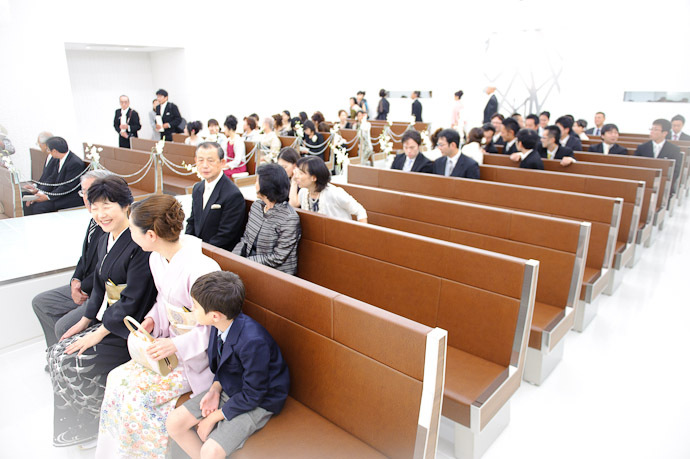 I've written before about Japanese chapel weddings here, though this time there was no “minister” as featured in that post. Also unlike that post, which features photos taken during a fake wedding to demonstrate a hotel's chapel for prospective couples, this was a real wedding and I couldn't move around, so all photos inside the chapel were from my seat (which, being husband to the groom's sister, was in the photographically advantageous front row, and thankfully at the end of the row, so I knew that I wouldn't be blocking anyone else's sight lines). I've known Shogo for 13 years, since he was a senior in high school, and I realized at the wedding that I've never really known him. He's always been the quiet type... friendly and affable, yes, but quiet, a man of few words. So I was completely surprised at the outgoing, totally at-ease man we experienced, on top of the world and just thrilling to a fun day. It was wonderful. The wedding venue had an interesting design... the couple exited the chapel via the doors at the back, into what appeared to be some other room, and the doors closed behind them. Then almost immediately, the doors opened again and the chapel was flooded with brilliant sunlight. It turns out that there were two sets of doors separated by a thin hallway; the outside pair remained closed when the couple exited the chapel, then when the inside pair was closed, the outside pair was opened to the sunlight, and then the inside pair was opened to let the sunlight flood in. It was quite a dramatic effect. 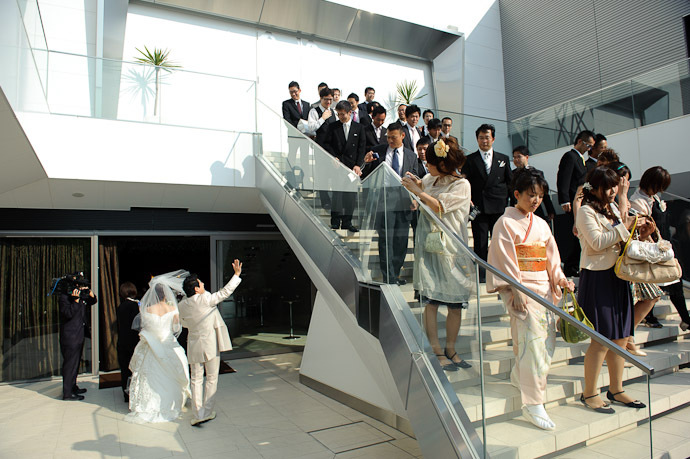 At the very top of the steps were the couple's parents, followed by close relatives and then more-distant relatives, and then friends spilling off the bottom of the steps. I should have been next to Fumie (in the purple kimono above), but this one time I stepped out of my place as a guest to get a better photo.... the venue offered an excellent location to get photos from a great vantage, but none of the official photographers were there, so I felt it was worth while to take the opportunity to try for some unique shots for them. The arrangement on the steps was designed to give the parents and close relatives the best position, but in looking at the photos, I realize it's really a great metaphor for life. The couple start out first with family (that they didn't pick, but were born in to), and progress toward the friends that they have chosen for themselves. I would have never imagined the Shogo I thought I knew doing this, but the new Shogo (or the old Shogo newly revealed to me) was on top of the world and thoroughly enjoying the day, and had no problem letting everyone feel and share in his joy. We all then went inside for phase two, the short hors d'oeuvre reception. Wonderful photos. You must have a really NICE camera! (Sorry=just couldn’t resist that) Beautiful bride with a very handsome father., the groom was handsome and so were his parents. But his sister was exquisite…I loved the “My Honey and our Boy” shot. 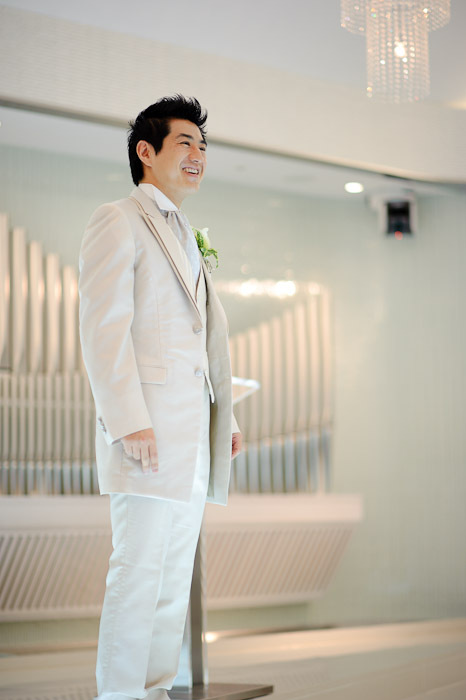 Did wonder a little about the stark white of the wedding chapel. Don’t most brides wear white there? 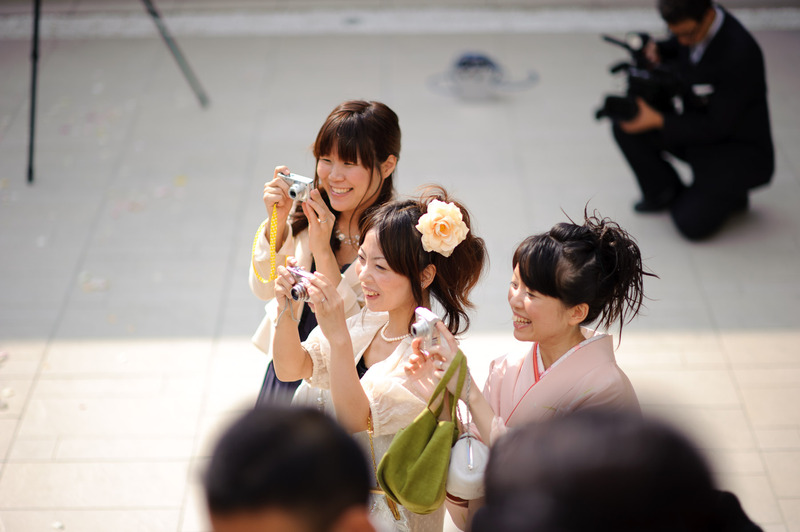 She and the groom, also in white, seemed to disappear into the background at times. Was that hard from a photographers point of view? Beautiful photos and thoughtful comments. I especially loved the kimonos worn by the mothers and Fumiye-san. Loved her hair also! 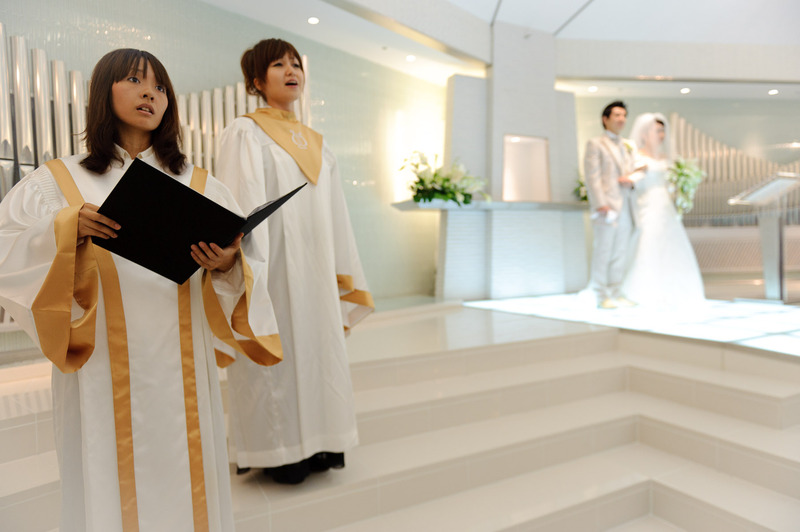 Great post – The Japanese know how to do events, and their wedding chapels (faux churches) are one of the best examples. This sounds like it’s a very interesting venue – and they definitely give a “white wedding” opportunity. 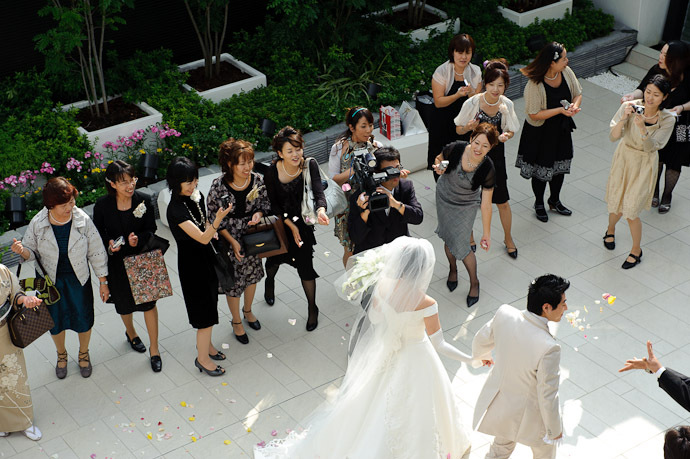 It’s fascinating to see Japanese weddings. Much different than weddings here in China. I’m impressed by the modern churches, with the bright interior and the illuminated floor. 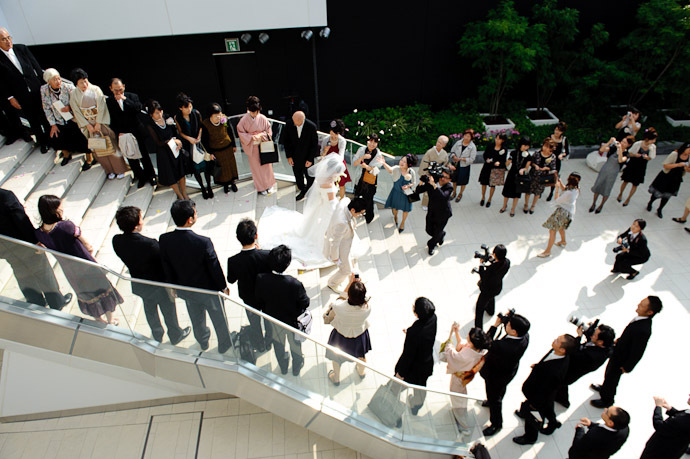 Congratulations to the new Mr. And Mrs. Matsunaka! Great post. I’ll bet they’ll love the photos AND the post processing you did. “Getting Seated” is really great, because I love a)how Fumie and her Mom are laughing together, and b) how awesome Fumie’s hair looked. I noticed it in that first shot, and confirmed it in each subsequent shot. Hair, outfit, attitude – I wish *I* could do elegant like that! Even though the photos of Shogo and Namiko were fantastic, I’ll have to echo the others in saying “My Honey and Our Boy” is the best shot of the set. 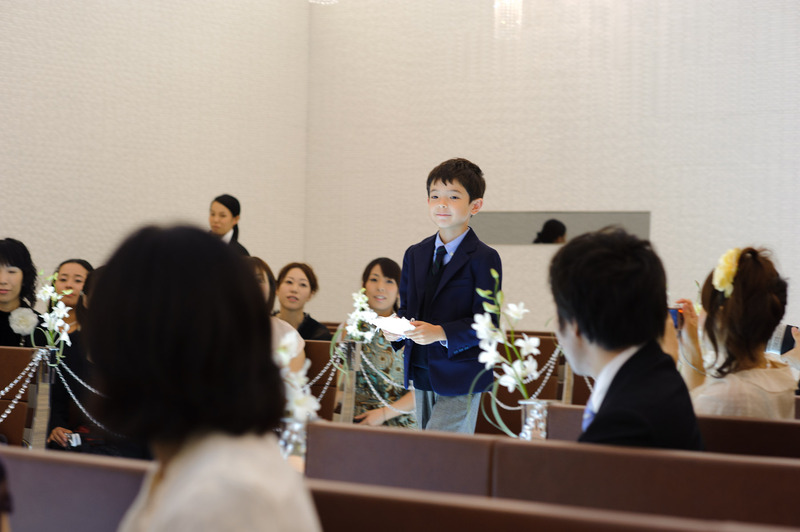 Some of these are simply breathtaking … Placing Her Ring, Presentation and My Honey and Our Boy … Sensational !!! “Getting Seated” seems like a still, where people are sitting in a inter-space flight, from a science fiction movie|series which starts with Utopian dream. As soon as I started looking at your photos and reading your commentary, I felt I had found very interesting new friends. I am hooked on your blog. This sequence of wedding photos is glorious. I would think the bride and groom must be very glad you were there – for more than just family reasons. I am enjoying your wildlife photography too (again – your commentary makes each story even more intriguing). Congrats and keep it all up!